This level have normal difficulty and you need to use good strategy to complete this level. For this level you should try to break the blockers by playing from the bottom. And as you will have more candies to play then try to make wrapped candy as much as you can. 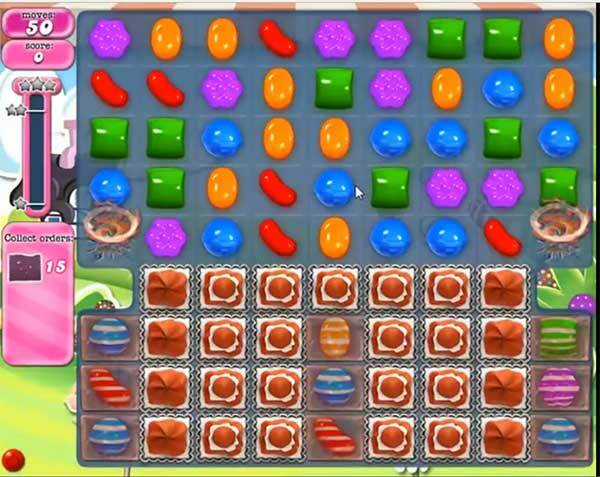 If you get colorbomb then combine with normal candy so you will have more other color candies on the board that will help to make more wrapped candy to reach the requirement. What and how do you get rid of the other 2 brown squares that are beside the 15? I have done the 15 several times but do not know how to get rid of the 2 brown that are next to the 15 on the top? I can’t get the two brown squares. I can get the 15 stripes. I can’t seam to make wrapped candies! I’m about to delete this game not FUN ANYMORE! I can’t get the brown squares on 364 I got the 15 but the two brown how do you do it?…..